After Ukraine, Will the U.S. Become an Energy Superpower? If you’ve listened to President Obama’s critics in recent days, you’ve almost certainly heard two claims. First, that under Obama, America is in retreat around the world. Second, that America’s retreat emboldened Vladimir Putin to invade Ukraine. Let’s take the second claim first. Obama’s critics differ as to which moment of White House fecklessness spurred Putin to act. “Ever since the [Obama] administration threw themselves in [Putin’s] arms in Syria … I think he’s seen weakness. These are the consequences,” insists Tennessee Senator Bob Corker. House Intelligence Committee Chairman Mike Rogers, by contrast,suggests, “The big one that started this was the absolute retreat on our missile defense system in Poland and Czechoslovakia.” Either way, there’s a causation problem. If it was Obama’s weakness—in the Middle East or Eastern Europe—that encouraged the Russian president to invade Ukraine, then how do Corker and Rogers explain Putin’s decision to do something similar in Georgia in 2008, back when George W. Bush was president? Which brings us to assertion number one. It’s true that the Obama administration has withdrawn troops from Iraq and is withdrawing them from Afghanistan. But from where Putin sits, American power hardly seems in retreat. From his perspective, in fact, the reverse is likely much closer to the truth. To understand why, it’s worth casting one’s gaze back a couple of decades. Under Ronald Reagan, the frontier of American power in Europe was Berlin. Then, in February 1990, as East Germany began wobbling, Secretary of State James Baker journeyed to Moscow to discuss German unification. According to James Goldgeier, author of Not Whether But When, the definitive history of NATO expansion, Baker promised Soviet leader Mikhail Gorbachev that if the Soviets allowed Germany to reunify, NATO—the U.S.-led Western military alliance that took form after World War II—would not expand “one inch” further east, not even into the former East Germany itself. But as the year progressed, the White House developed different ideas, and by the fall it was clear that a unified Germany would enter NATO, no matter what the Russians thought. The idea of admitting other Eastern European countries into NATO, however, was still considered recklessly provocative toward Russia. The New York Timeseditorial board and its star foreign-affairs columnist, Thomas Friedman, strongly opposed the idea. The eminent Cold War historian John Lewis Gaddis wrote that, “[H]istorians—normally so contentious—are in uncharacteristic agreement: with remarkably few exceptions, they see NATO enlargement as ill conceived, ill-timed, and above all ill-suited to the realities of the post-Cold War world.” George H.W. Bush’s national security advisor, Brent Scowcroft, was skeptical of the idea, as was Bill Clinton’s defense secretary, William Perry. For his part, Russian President Boris Yeltsin warned that extending NATO violated the “spirit of conversations” between Baker and Gorbachev, and would produce a “cold peace” between Russia and the West. It didn’t matter. In 1995, NATO went to war against Serbia, and then sent peacekeepers to Bosnia to enforce the peace agreement that followed. This new, Eastern-European mission paved the way for further expansion. By 1997, it was clear Poland, Hungary, and the Czech Republic would enter the alliance. In 2004, NATO admitted another seven former Soviet bloc countries, three of which—Lithuania, Latvia, and Estonia—had been part of the USSR. In 2009, Croatia and Albania joined the club. Six former Soviet republics—Ukraine, Georgia, Moldova, Kazakhstan, Armenia, and Azerbaijan—now link their militaries to NATO’s via the “Partnership for Peace” program. All five former Soviet republics in Central Asia—Kyrgyzstan, Tajikistan, Turkmenistan, Kazakhstan, and Uzbekistan—provide NATO countries with some basing, transit, refueling, or overflight rights for use in the Afghan war. From Putin’s perspective, in other words, the United States hardly looks in retreat. To the contrary, the post-Cold War period has brought one long march by America and its allies closer and closer to the border of Russia itself. But there was no reason to believe that Russia—which under Putin has been regaining its confidence on the world stage—would go on contracting forever. And by 2008, when Russia sent troops into parts of Georgia, it was already clear that NATO’s expansion onto former Soviet soil had come to a halt. To say that the border of Western power has stopped expanding is not to say it has begun to contract. To the contrary, it’s still almost impossible to imagine any of the countries recently admitted into NATO falling back under Russia’s sway. Geopolitically and ideologically, the West’s frontier has moved further east than almost anyone could have imagined a couple of decades ago. The bad news is that it has left the countries just beyond that frontier, the ones most eager to be connected to the West, terribly vulnerable. During the Cold War, Poland, Hungary, and Czechoslovakia shared that tragic fate. Today, Georgia and Ukraine do. 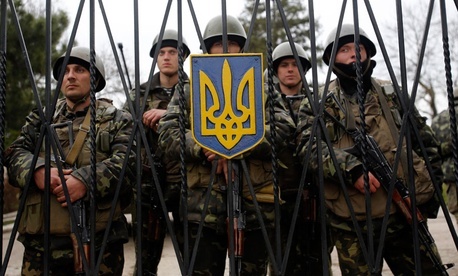 None of this remotely justifies Moscow’s crude and lawless invasion of Ukraine. The U.S. and its European allies should do everything possible to strengthen the government in Kiev politically, economically, and maybe even—clandestinely—militarily. And they should think creatively about what kinds of economic and diplomatic measures might hit the Russian elite where it hurts, with the hope of at least stopping a Russian conquest of all of eastern Ukraine. That such efforts may undermine Russian cooperation on other issues, like Iran and Syria, is a risk the West will have to take. But the Obama administration will also have to tell Kiev’s revolutionaries that while it supports a unified, democratic Ukraine, it does not support an anti-Russian Ukraine. Russia will not permit it, and at the end of the day, the United States cannot protect Ukraine from Russia’s wrath. It’s a bit like Finland’s dilemma during the Cold War or Taiwan’s now. Even if Ukraine regains control over its domestic affairs, it will never enjoy complete control over its foreign policy. The U.S. has a moral obligation to support democracy and self-determination. But it also has a moral obligation not to make promises it can’t keep. That was true before Obama, and it will be true after he’s gone. And it has nothing to do with America being in retreat.